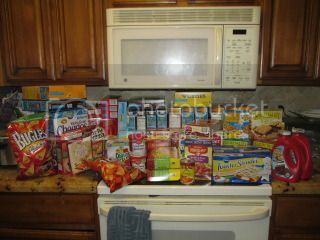 DB and I got all of this for about $20! I just want to brag about my awesome savings. Thats 60 items! And we're going to go back for more today. They are having this deal where if you buy 5 of these betty crocker/General Mills items, you get a $5 coupon back. Where the heck did you go?! Wow that is impressive!! Way to shop! Unfortunately I don't eat any of that stuff as it is all processed, but kudos to getting the most bang for your buck!! Fry's, which is a Kroger store. Its a really awesome deal. Like the Mac and cheese doesn't even need coupons, they're only a dollar each! So if you buy 5, you get $5 back and they're free! We probably won't eat half of it. A lot we give to DB's Mom because she doesn't make much money and is taking care of two people in the house right now. Cereal and canned foods are cheap and filling. Plus I plan on giving the stuff we don't use to homeless, or sending some in care packages to soldiers. That's awesome! I want to coupon so bad, I totally get a rush from saving money, but we don't eat any of that stuff. If only I had a normal person's metabolism. We do really really well with stuff from CVS too. That would be dental stuff, hair stuff, makeup, paper goods, razors, etc. That stuff doesn't have to do with food! Plus you are always going to use toothpaste and razors and stuff, and those are very expensive items. This just happened to be a free food week. We really don't usually buy this stuff, but it was too good of a deal to pass up. ETA: I said "stuff" like ten times. Awesome job!I wish there were that much savings up here in Alaska! That's awesome! I really need to get back into couponing. I use them here & there but I miss getting great deals like that!